Pair of replacement V clips used to secure the evaporating pad onto which the Octagon 20 or 40 Incubator Humidity Pump drips water. 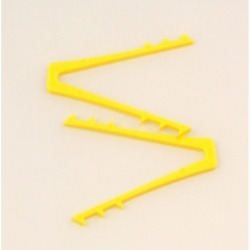 The V clips look like yellow hair grips. Note these V clips are not compatible with the older H22 Humidity Management Module.